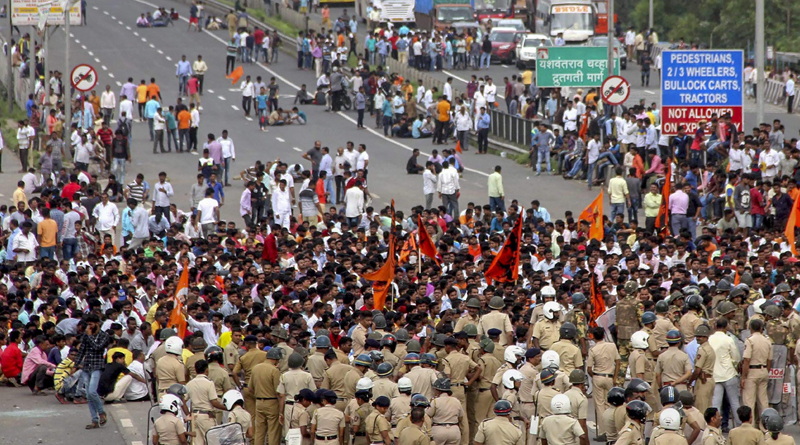 Maharashtra was wracked last week by a violent agitation by Marathas for, among other things, a reserved quota in government jobs. Instead of facing up to mob violence — not only by caste-based groups and other vote banks but even lynch mobs — state governments generally try to mollify them. Mob leadership leads not to jail but political prominence and ascendance. Violence becomes a form of political clout, not of crime. This naturally encourages further criminal violence. Agitation leaders often claim to swear by peaceful methods only. They explain away mob violence as the excesses of misguided youths, or as the hijacking of a peaceful movement by a few lumpen elements. Sorry, few will believe there is no connection between the leaders and the vandals. Mahatma Gandhi led a non-violent agitation in 1922 that degenerated into violence at Chauri Chaura, where a mob burned a police station. Gandhiji immediately took responsibility, called off the agitation, and asked the judge in his case to impose a severe penalty on him for committing a “Himalayan blunder” in believing the agitation would be peaceful. Will the leaders of the Maratha agitation, or the Patidar agitation in Gujarat, or of other agitations by sundry vote banks, ever take responsibility for violence as Gandhiji did? Will they call off their agitations if these turn violent? Will they ask for jail sentences, for themselves or their followers? Not a chance. Non-violence may have succeeded under the British Raj, nothing succeeds like violence in independent India. The mob has numbers, numbers matter in elections, so democracy accommodates mobocracy. The rule of law requires accountability, but there is none for mobs and their leaders. How do we establish accountability? One obvious step is financial. Buildings and vehicles are routinely set on fire in many agitations. All economic activity comes to a halt, causing losses of crores of rupees to livelihoods and production. It can reasonably be argued that economic shutdown in a peaceful agitation is a price worth paying in a democracy. The same cannot be said of destruction of private and public property. Surely the cost of such destruction should be borne by the organisers of such demonstrations. Mere claims that they have peaceful intentions are not enough. When property is destroyed by an agitation, there is a case for jailing the organisers for abetting vandalism, and levying large fines on the organisations, the proceeds of which will be given as compensation to those adversely affected. Today, violent agitations pay handsome dividends politically. Instead they should be made expensive in terms of fines and jail sentences. Once, identifying exactly who in a mob set fire to which vehicle or building was difficult, sometimes impossible. But modern technology, CCTV cameras and smartphones provide hundreds of images of mob violence and its perpetrators. With face recognition technology improving rapidly, the ability to identify vandals precisely has also improved hugely. These techniques must be used to track down and jail the culprits. This must be done quickly to have any effect, Today, police investigations can take months or years, prosecutions take more years still, and even if some are found guilty, they appeal to higher courts. Hardly anybody with resources gets convicted beyond appeals. This provides effective immunity to the vandals. It encourages political parties to use ever more vandals. The answer lies in police-judicial reforms to bring in a rapid, tech-savvy form of policing and justice. In Bihar, DIG Abhayanand devised ways to fast-track cases under the Arms Act, get convictions within two weeks, and this crushed gangsterism in Nitish Kumar’s first term. Abhayanand told me that normal police procedure focused on long written interrogations of dozens to hundreds of witnesses in a mob crime. Many such witnesses disappeared without a trace, or turned hostile under pressure from the accused. Lawyers took years to examine and cross-examine witnesses. Instead, said Abhayanand, the police should shift to high-tech forensic evidence that is quickly obtained, and cannot disappear or turn hostile. All police forces must be trained in high-tech forensic methods to catch criminals, instead of torturing them to extract confessions (as is the case today). This approach will help discourage mob violence, by the Marathas or any other group. Camera footage from sundry sources will provide far quicker and surer evidence than trying to draw up a long list of witnesses. Camera evidence can be manipulated, so its authenticity must be proved. But that should not take long, especially when multiple cameras show the same criminal. This can lead to quick trials and convictions. More important, it will encourage peaceful agitations and politicians, and discourage violent ones.